ACE has developed a modeling package specifically for the simulation of explosion events involving vapor clouds, condensed phase high explosives, and bursting pressure vessels. 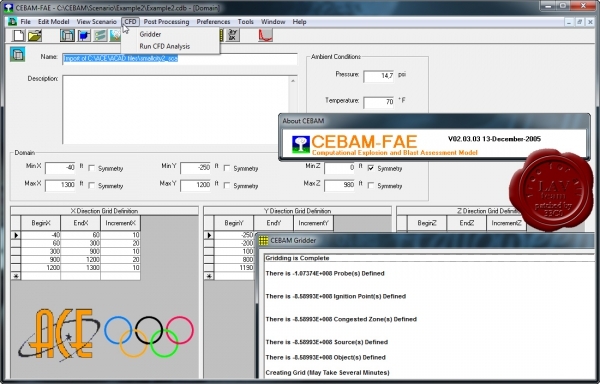 This tool, CEBAM, offers the latest Computational Fluid Dynamics (CFD) and hydrocode technology. Coupling sound scientific algorithms with an efficient graphical user interface (GUI) brings the advantages of first-principle modeling to the project engineer. The user is able to build scenarios as complex or simplified as needed. The preprocessing stage is much shorter than typical CFD and hydrocodes. CEBAM also incorporates the latest in visualization techniques such as VRML to assist you in visualizing your facility and scneario. The VRML viewer is CEBAM allows the user to walk-through their facility to verify model accuracy or communicate what is being done to others. CEBAM generates a VRML file that can be sent to others and viewed using freely available VRML client software. For post processing, CEBAM uses a state-of-the-art package called Tecplot. Tecplot is available through ACE or directly from AMTEC. Tecplot allows the user to create animations of the explosion, contours, and time histories.